A redesigned classic with state-of-the-art circuit technology and correspondingly low self-noise. Like the legendary M 50, this tube microphone is ideal for orchestral recording. Since the 1950s, the Neumann M 50 has been heralded as the ideal microphone for orchestral recording and string scoring. 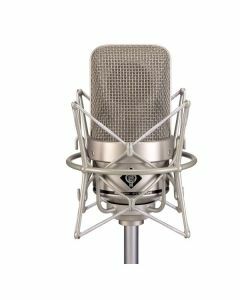 With its phenomenal transient response and unique directional characteristic, this classic mic has endeared many fans, both in the control room and on the soundstage. The new M 150 Tube takes many of the features from the original M 50 and incorporates them in a very modern microphone. With low self noise, a Titanium membrane and capsule, transformerless tube amplifier and sophisticated power supply, the M 150 Tube is not a reissue but an entirely new microphone in its own right. The Titanium diaphragm of the pressure capsule is 12 mm in diameter and is exceedingly thin. Although Titanium has been known to have unique and desirable characteristics for some time, it has, until very recently, been very difficult to procure in the quality necessary for use in a microphone of this type. The headgrille is shaped just like that on the original M 50, as requested by various top engineers in the recording industry. Due to mounting the pressure capsule with the diaphragm flush to the surface of a small (40 mm) sphere, the directional characteristic of the M 150 Tube is entirely unique. At the lowest frequencies, this system is a pure omnipressure transducer with a perfectly circular polar pattern. However, in the mid- and upper frequencies, the pickup pattern becomes more narrow. The M 150 Tube is an ideal microphone for any stereo, 5.1 or 7.1 surround recording, particularly DECCA Tree technique. The dynamic range of the M 150 Tube is 119 dB, allowing reproduction of the full musical expression, without restraint. With a low self noise of 15 dB-A, more gain can be used without risk of adding noise to the final product. The transformerless output circuit of this microphone allows for extremely fine reproduction of small signals and low frequency information. Also, long cable runs can be used with no loss of signal quality. At the rear of the microphone is a –10 dB switch and a switchable footfall filter for the attenuation of frequencies below 40 Hz. In the position “LIN”, a limit frequency of 16 Hz is made active. This is mainly to protect the console inputs from the effects of sub-audio noise (e.g. strong air currents). The –10 dB function is effected by voltage division and should be used only where the danger of over-loading follow-on equipment with very high signal levels is present. This switch does not extend the dynamic range of the microphone, but shifts the output level down by 10 dB.